Pensions Dispute FAQ’s – What’s happening, What does it mean? The negotiations are still under way and we don’t know the final proposals or exact changes yet, so why strike now? What are the specific changes ministers are proposing? What exactly will the pension changes mean to me (as an individual)? Will the strike make the government ministers change their mind? 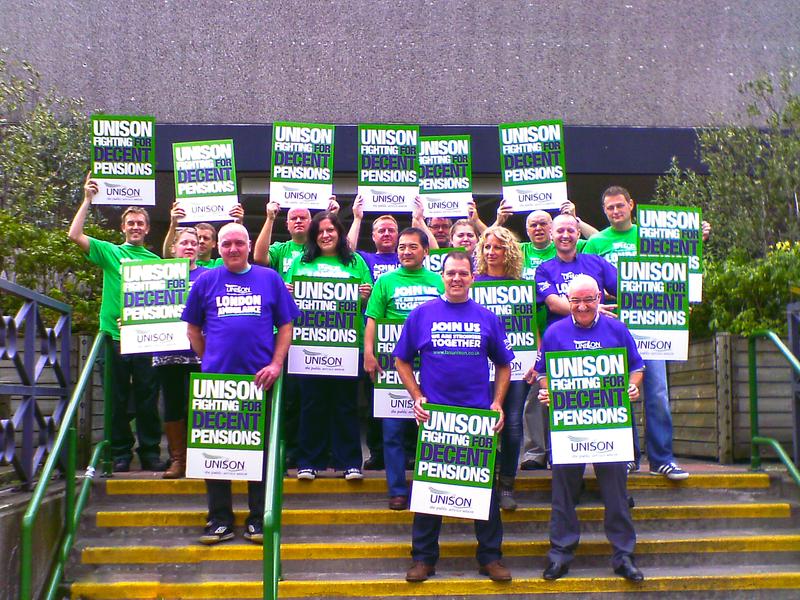 Why is UNISON taking action on pensions when we haven’t on cuts? The media keep saying our pensions are unaffordable for the country, how can we get our message out better? Will the 3% hike in pension contributions improve my pension or make my pension scheme stronger? What is the “Fair Deal on pensions” and why should I be concerned? Is this the same as NHS “Choices” exercise? What happens after the day of action on the 30th – will there be more strikes? What about the clients I work with? They are vulnerable – I can’t let them down. Why are we balloting members in the Community service group about public sector pensions? My employer is saying that a one-day strike would be seen as a break in service and that my continuity of service would be broken – is this true? I’m in my first 12 months of employment – what are my rights? I earn less than £15,000 so my contributions won’t change, why should I strike? Why should I strike when I’m not in the pension scheme? I think I’d be better off under the ‘career average’ (CARE) scheme so why should I strike? If members vote ‘yes’ to industrial action, what happens next? take part in the proposed action? changes that are suggested in the Hutton report from ‘final salary’ to ‘career average’ pensions which will reduce some workers’ pensions further. The change (already implemented) to using the consumer Price Index (CPI) instead of the Retail Price Index (RPI) to calculate cost of living rises will result in pensioners being around 10% worse off by 2017.
successful. So far that has not been the case. The negotiations are still under way and we don’t know the exact changes proposed yet, so why strike now? Strike action is very much a last resort for UNISON – we are not known as a strike happy union – quite the reverse. proposals that will have a serious and detrimental effect on members’ terms and conditions. We may not have the detail yet, but the basic framework under discussion in the negotiations is perfectly clear – almost all pension scheme members will be asked to pay more, to work longer, and receive less. us to just accept that the pension plans are an economic necessity when in fact they are just another way of making public sector workers pay for the banking crisis. for them to backtrack from these damaging proposals. When people show the strength of their feelings in the ballot, we believe that ministers will begin to listen seriously to our arguments and will begin to negotiate in real terms. If we aren’t able to make them re-think their stance then they will drive these proposals through and we may never be in a position to recover the ground we have lost. That’s why getting a resounding “yes” vote matters! account for inflation – from a link to RPI to CPI. This change alone will reduce the value of your pension by around 10% – 15% as CPI is usually significantly lower than RPI. member. This will mean an increase of approximately 50% for many members. changes to the way pensions are built up that will be detrimental to many. We don’t know the specific details of those changes yet, but we know it will broadly mean members paying in more, working longer and getting less in return. For more information see our main pensions web pages which have briefings containing more information about each of the different schemes. different contribution rates). So calculators and other examples don’t apply to Scotland. Changes recently imposed by UK ministers to index pensions by CPI rather than the more generous RPI mean your pension is now worth less and you will receive less when you retire for all schemes. exempted from the contributions increases – only LGPS. The issue on “Fair Deal” does not apply to Scotland. yet. However, changes already announced or implemented will mean most people will be paying more, everyone will be working longer and everyone’s pension in retirement will be worth less than it would have been. the NHS to work out their own position. As soon as the detailed proposals are published, we will add a local government LGPS one. about our pensions is vital. stall in your local town centre and providing leaflets or talking to people. which suggested ways to reform the scheme. put back into the fund or reinvested. funding for services. So where the larger scale reforms suggested by Lord Hutton are at least in principle intended to strengthen the schemes AND make savings the short term savings are just about getting money directly or indirectly to central government. In effect this means that the separate announcement of a further 3% in contributions is simply going to directly or indirectly to the treasury. Fair Deal does not apply in Scotland. they will be taking action. It is possible but at this stage we are planning just the single day of action. In the past this has brought the employers back to the negotiating table. The TUC unions will meet after 30 November to discuss further action. But we may need to take action. UNISON understand your concerns and we know that you are feeling the rough end of the recession right now. But it’s important to think about what the proposed pension scheme changes could cost you in extra contributions, and the money you need in retirement to support yourself. bolder in their attacks on public sector workers in future. vulnerable – I can’t let them down. best possible public services for everyone. responsibility to provide this cover. Although members in community and voluntary organisations and housing associations don’t work in the public sector, many of them are in the public sector pension schemes. Government or NHS Pension Schemes. it clear to ministers that you will not accept what they’re proposing to do. I am facing redundancy. Won’t going on strike make it more likely I am maderedundant? absolute. Any dismissal regardless ofhow long the employee has worked, or their age, is automatically unfair unless a tribunal decides the dismissal was not to do with the industrial action. Employers know this and in the most part are not about to risk breaking the law. However, management may attempt to isolate – or indeed intimidate – individuals or small groups with the view to encouraging strike breaking. There may be threats concerning your careers or of disciplinary action. If this does happen make sure you report this to your Branch officers in the first instance. They will take this very seriously and act upon it. My employer is saying that a one day strike would be seen as a break in service and that my continuity of service would be broken – is this true? employment, but it does not break the continuity of your period of employment. their rights so appealing to bid for either! official industrial action. During these 12 weeks the protection is absolute. Any dismissal regardless of how long the employee has worked, or their age, is automatically unfair unless a tribunal decides the dismissal was not to do with the industrial action. whether they should be regarded as on sick leave or on strike. strike action, average earnings will reflect the lower earnings during the period leading up to the illness. 23. What if I take annual leave? you can take part in any strike action. contribution for that day. The impact on your final pension would be extremely small but you might want to consider replacing the lost contribution. and employer contribution and receive full credit for the day’s absence and continue to have full cover. Any member wishing to do this must inform their employer in writing before the absence takes place. than £15,000 in the future. full time equivalent position so you may earn less than £15,000 but still end up paying more if you are part time. 26. Why should I strike when I can just leave the scheme? as your benefits in service would still build up and be enhanced by further years in it. 27. Why should I strike when I’m not in the pension scheme? If you have been balloted, it is because you are entitled to join the scheme. Access to the pension scheme is part of your agreed terms and conditions and make up part of your benefits package. The fact that you are entitled to this benefit means you are potentially affected by the detrimental changes to it. Public service workers have already had to put up a great deal since the economic downturn caused by the banking crisis and we are well aware there may be other very pressing difficulties you are being faced with right now on a local or personal level. We consider that this an unnecessary attack on an important part of your terms and conditions of employment. 28. I think I’d be better off under the ‘career average’ (CARE) scheme so why should I strike? on the design of the scheme. However, the change in up rating mechanism for your pension from RPI to CPI will already have cost you around 15% in lost pension income and the additional contributions would mean you paying much more for whatever scheme eventually comes into force. We don’t yet know thefinal detail of the final scheme changes but the increase in contributions and the change to CPI are already costing our members dear. 29. Do I have to strike? 30. Would I still have to strike if I voted ‘No’? 31. Will I get a vote? terms and conditions at work. industrial action you won’t be taking part in this ballot. 32. What’s the ballot timetable? The ballot opens on 11 October and the ballot closes on 3 November. included in the ballot, you can contact the ballot helpline on 0845 355 0845. You should do this before noon on 31 October. 33. Are other unions balloting for action? Most of the unions with members in public service pension schemes are balloting over possible action. 34. If members vote ‘yes’ to industrial action, what happens next? until called to do so by the union. You and your branch will be notified if any further action is planned. the necessary cover – if you are needed to provide emergency cover the branch will be in contact. 35. Do I have to tell my employer if I am going on strike? 36. Will I lose pay and if so how much? If employers decide to deduct pay from those taking strike action, branches are advised to seek agreement at local level for deductions of no more than 1/7th of weekly income (i.e. 365th of annual income) for a single day of strike action. It is essential in these discussions that branches ensure that deductions are pro rata’d for people who work part-time or term-time. Where branches already have existing local agreements on deductions for strike action then we would expect those agreements to be followed by the employer. they are for the exclusive benefit of members. New members can join UNISON, and join the strike, right up to and including on the day of action. So the answer is very much YES you can join the strike – you just need to fill in an application form first and hand it to your local steward. 38. What should I do if I’m not involved in the ballot or any action? proposed day of action – 30 November. Speak up for public sector pensions! It is the responsibility of your employer to providing appropriate emergency cover. This will need to be negotiated locally. ballot will run from 11 October to 3 November. If branches are contacted by employers on exemptions, NO agreement must be given without referral and approval by the region. exempt members we have balloted. Employees currently in their last year of service with their employer who are members of the Local Government Pension Scheme. service will not automatically be exempted. Pregnant women who have notified their employer of the expected date of birth (unless there is a clear commitment from the employer that the member will not suffer detriment as a result of her taking strike action). People whose state benefits may be affected if they take part in strike action. (JSA). Someone who is involved in a strike or trade dispute cannot claim JSA. Where that person is part of a couple, his or her husband, wife or civil partner may be able to claim JSA but will not receive any extra benefit in respect of the person who is on strike. tax credits when the period of absence due to strike action exceeds 10 consecutive days on which the employee should have been working. However the claimant must keep their benefits office aware of their circumstances. Any members receiving exemptions should be asked to donate a day’s pay to a strike hardship fund.…. As you know, UNISON is balloting your NHS members as to whether they will take industrial action in the form of strike action. The ballot will run from 11 October to 3 November 2011. If there is a “yes” vote an initialday of strike action is planned for 30 November. across the union is to deliver a high turnout in the ballot. consider and also the branch when preparing for industrial action. Exemptions from strike action will be approved at regional level. Within the branch, identify colleagues with the right skills who can best take the lead on discussions around emergency cover. It is the responsibility of employers to discuss emergency cover in preparation for any potential industrial action and to engage with Staff Trade Unions. All staff side can participate in emergency cover discussions. However only those organisations taking industrial action can agree what is and is not appropriate cover. However, it is important to ensure there is maximum collaboration and coordination with the full Staff Side. UNISON represents all staff groups (except Medical staff) so should be included in all discussions on emergency cover. In the lead up to the strike day employers should make plans to ensure that those patients who can be discharged or go on temporary home leave will have services they may need put in place well in advance. Close liaison with neighbouring employers and other branches may assist with this. Common practice by employers is to recommend bank holiday cover when industrial action takes place. Employers should draw up a list of services where such cover would and would not apply. Employers should identify services which are only provided by on call arrangements on a bank holiday. Employers should anticipate where deliveries/supplies are affected on the day(s) of action and arrange for wards, units & departments to ensure that they have adequate stocks in place. Employers should encourage staff to pre-plan their work and ensure that vulnerable adults are aware of the dispute and agreed emergency cover and have access to an emergency contact should they require assistance. It should be clear to members why we are taking this action – Branches should hold meetings with members and other staff and share with them employers’ plans and proposals on cover, and seek their views. Information explaining why members are taking this action should be available for visitors and patients.